Within a few years of medicinal researching, this healing tea – legendary in parts of Asia – advanced to the royal league of the best plant remedies in the world: Jiaogulan, the “Herb of Immortality:” “Five Leaves Ginseng”. In the vernacular, the tendril-climbing plant Jiaogulan (gynostemma pentaphyllum), originating from Asia’s rain forests, is also called the “Herb of Immortality,” “Ginseng of the South” and “Five Leaves Ginseng.” Now, after hardly twenty years of medical research, this inconspicuous plant has been placed into the royal league of healing plants – into the select group of “adaptogens,” i.e. non-poisonous plants producing universal and quasi “intelligent” medicinal benefits; depending on the needs of the body, they activate weakened bodily functions and provide a safeguard against superfluities inside the body. At the same time, they strengthen the immune system and health in general, nota bene: without any side effects. Ginseng, Ling-Zhi mushroom (Reishi), Schisandra (Chinese berry grape) and Ashwaganda (Indian sleeping berry) also belong to this royal league of healing plants. Jiaogulan researchers at the Japanese Ehime University of Matsayuma, at the Medical Schools at Guiyang and Hengyang, at the University of Traditional Chinese Medicine of Shanghai and at Loma Linda University in California all attest to the rain forest plant: Jiaogulan improves the nutrient supply of all internal organs and the cardiac output and thus blood circulation in general. It has a positive influence on the endocrine system and regulates the central nervous system. In times of stress the plant is able to harmonize lapses of the organism and sexual disturbances. It also protects the liver and regulates the cholesterol level and the lipid metabolism. Its antioxidant effect, which protects cells from premature ageing, is of particular importance. Here, Jiaogulan activates the release of the super oxide dismutase (SOD) – a very strong endogenous antioxidant production which decreases with age. Several studies published in the renowned Journal of Traditional Chinese Medicine prove: amongst others, Jiaogulan prevents apoplectic strokes, heart attacks, arteriosclerosis and numerous other diseases and is able to reduce the number of cancerogenous substances in the body. Even an active ingredient amount contained in 2-4 teaspoons of the herb is effectual. Moreover, medical scientists of „Vanderbilt University Medical Center“ in Nashville, USA, and other universities found out that Jiaogulan can lower high blood pressures quite effectively. During a double blind study with 223 patients, one third of the probands were given customary conventional medication, one third received Ginseng, and for one third Jiaogulan was applied. While 94 per cent of the probands treated with conventional medicine showed clear hypotension, only 46 per cent of the participants treated with Ginseng showed such results; whereas in the case of participants treated with Jiaogulan, however, 82 per cent reacted – almost as many as in the case of alpha blockers administration in conventional medicine. At the same time, patients with a low blood pressure do not experience further lowering of the pressure. Several tests also showed that Jiaogulan has a positive influence on haematosis; e.g. the liana protects lymphocytes, which are important for the immune defence. Thus, for example, in the case of cancer patients with a too low amount of white blood cells after chemotherapy or radiotherapy, the number of these cells is clearly on the rise again. Even competitive athletes in top form profit from the effective forces of Jiaogulan. In a study with 300 professional athletes at the Medical University of Guiyang – among them members of the Chinese national figure skating team - a clear improvement of their ability to respond and their mental balance as well as lessened nervousness and insomnia before the competitions was observed. 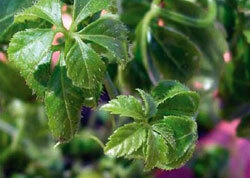 For a long time, the extraordinary healing power of the herb was not noticed. Even in Traditional Chinese Medicine it was only discovered very late and, until the present, its application remained constricted mainly to the vicinity of the southwestern Chinese province of Guizhou. Although a first medical study in 1972 had attested Jiaogulan a healing effect on chronic obstructive pulmonary disease, the “wonder herb” really became known for the first time twenty years ago: Japanese biologists around Dr. Tsunematsu Takemoto discovered the active substances of ginseng (special groups of saponines) in the plant by coincidence, although it was botanically not at all related to Ginseng. As opposed to Ginseng, Jiaogulan possesses the great advantage that the leaves can be harvested year by year whereas the Ginseng root requires many years in order to accumulate sufficient active substances. It has only been for a few years that Jiaogulan has not only been collected as a wild herb but has also been cultivated to a greater extent and is now also available as a tea or as herbal grist for intake. Meanwhile, Jiaogulan is considered to be superior to Ginseng with regard to its effect as the liana contains greater amounts and a broader diversity of active substance contents, the “ginsenosides.” Ginsenosides is the description of a group of saponines which were originally identified as active substances in Ginseng. Four of these ginsenosides are absolutely identical with the saponines that are to be found in Jiaogulan and further seventeen are very similar. Moreover, even 82 more active saponine substances – named gypenosides – were additionally isolated in Jiaogulan. For some time, however, ginsenosides have been known for their positive influence on the immune system, vitality and potency improvement, defence and neutralisation of free radicals, the heart and cardiovascular system, high cholesterol level, in accompanying cancer therapy and during stress. 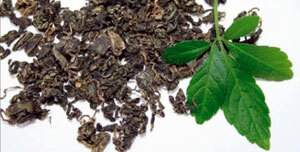 Jiaogulan tea consists of the leaves of the rain forest liana, which are dried naturally and with consideration. The flavour of the tea is mildly sweet and reminding slightly of liquorice; children quite enjoy drinking it every day. The perfect tea only consists of the leaves and not of pieces of branch or bark. One usually takes two to three teaspoons of tealeaves on one litre of hot water and lets it strain for three minutes or more. The tea can be enjoyed as pure Jiaogulan or it can be blended with other herbs. Due to its sweetish flavour, it improves in particular the aroma of tart or bitter teas. After about a month, a clear increase of vitality can be observed. Beside in the form of teas, Jiaogulan is now also available in Europe as an herbal grist which can be easily taken on a spoon or which can be sprinkled over muesli – this way one is able to take up a larger amount of active substances quite easily.